The Space Shuttle Endeavour is on a cross-country tour as it makes its way aboard a Boeing 747 carrier plane to the California Science Center where it will go on exhibit. The shuttle’s flight was designed to provide sighting opportunities for enthusiasts across the south and west coasts. On September 19, the shuttle made a layover at NASA’s Johnson Space Center in Houston, Texas. On September 20, Endeavour stopped overnight at Edwards Air Force Base in California, before heading off for a flyby of the San Francisco area, NASA’s Ames Research Center, and Vandenberg Air Force Base. It will then head for the Los Angeles area, conducting low altitude flybys of the Jet Propulsion Laboratory and California Science Center among other sites. Endeavour’s flight will end in Los Angeles on September 21, after which it will take to the road on the final leg of its final journey. 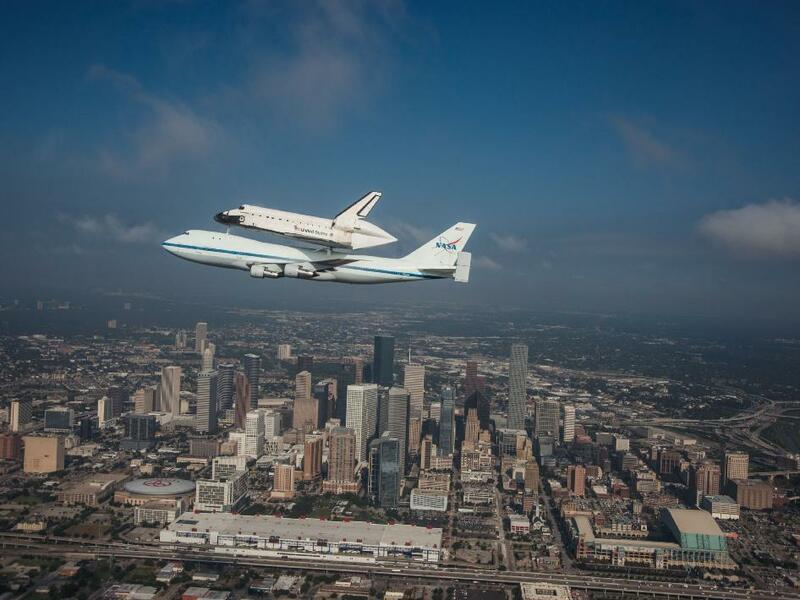 Endeavour flies over Houston aboard the Shuttle Carrier Aircraft. This photograph was captured by a NASA T-38 chase plane (Credits: NASA/Sheri Locke).